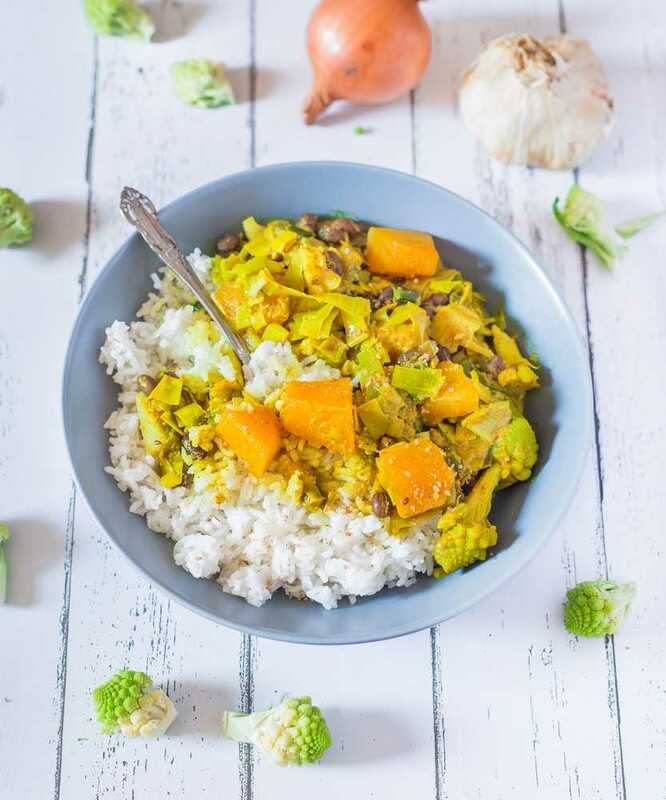 This Easy Coconut Curry is vegan, gluten-free, oil-free and delicious! It’s a very flavorful and nutritious meal that all your friends and family will love! 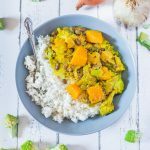 Sometimes you just want a hearty, comforting, delicious and easy-to-make vegetable curry, am I right? Well, this recipe will satisfy all your needs. 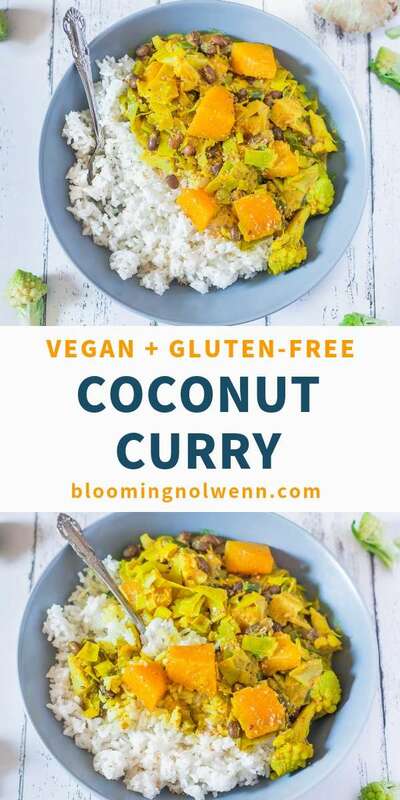 The other day I was wondering what to make for dinner when I saw a can of coconut milk and some curry powder in my pantry. 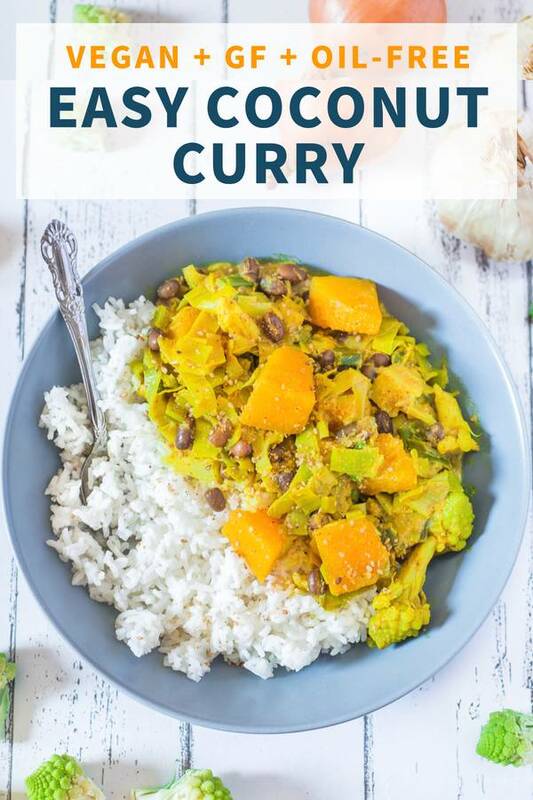 I absolutely love the combo of these two ingredients so I had to use them in a vegetable curry. This curry is a wonderful mix of textures and spices. Cooking the veggies in the coconut milk makes them very tender. 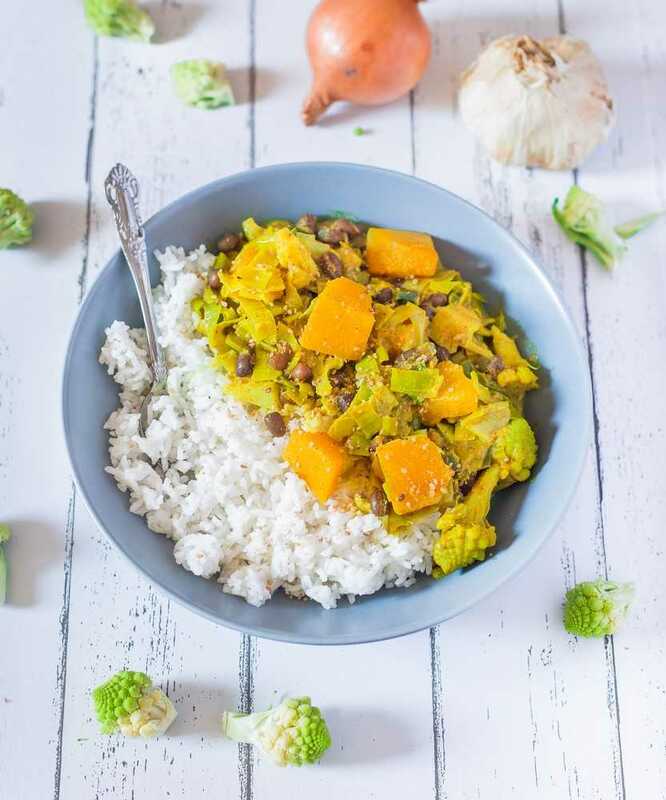 Served with basmati rice, this simple curry makes a very filling and nourishing meal. I like to make a big batch of this curry so that it lasts us for a couple of days. I personally don’t mind having the same thing for lunch or dinner two days in a row, especially when it is this good. 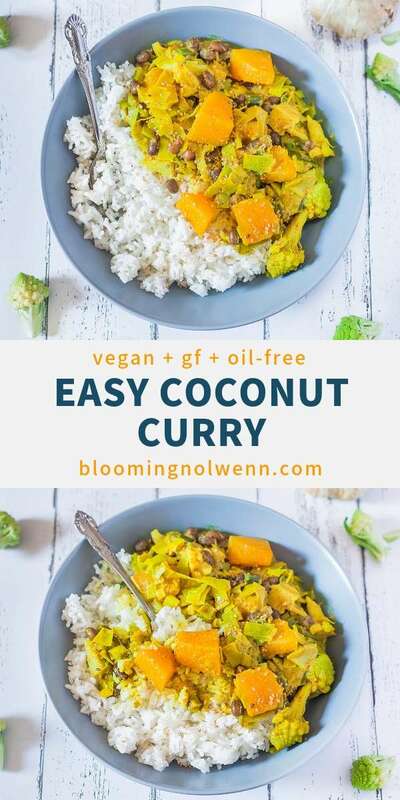 This Easy Coconut Curry is vegan, gluten-free, oil-free and delicious! It's a very flavorful and nutritious meal that all your friends and family will love! Soak the kidney beans overnight and cook them the following day. Chop the garlic, onion, leeks, pumpkin and romanesco. Place the garlic and the onion in a pan with a little bit of water and cook for 10 minutes or until translucent. Add in the chopped leeks, pumpkin, romanesco, coconut milk, water and curry powder. Cook over medium heat for 20-25 minutes with the lid on, or until vegetables are soft. Meanwhile, you can cook the rice. When the vegetables are cooked, add in the cooked kidney beans, stir well and cook for another 5 minutes. 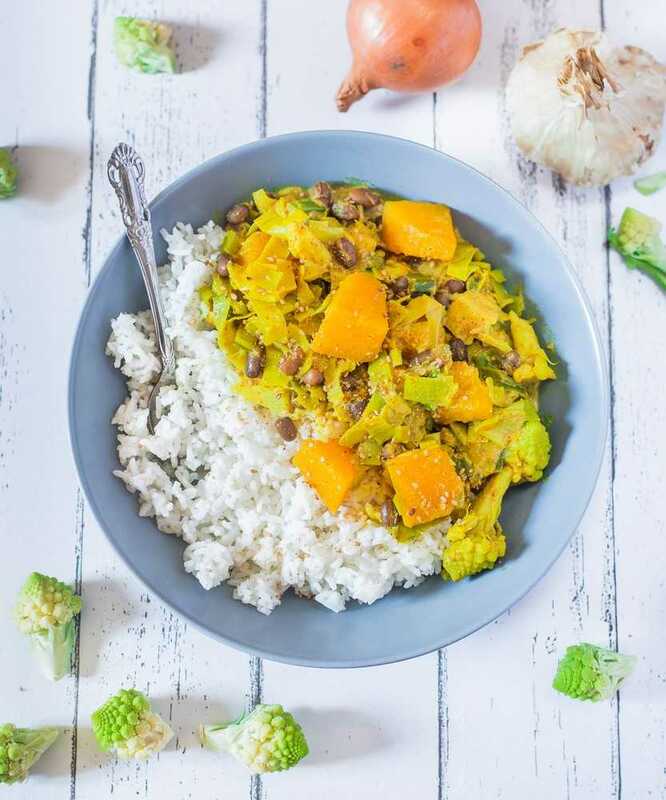 Serve the curry over the rice and enjoy while it's hot!